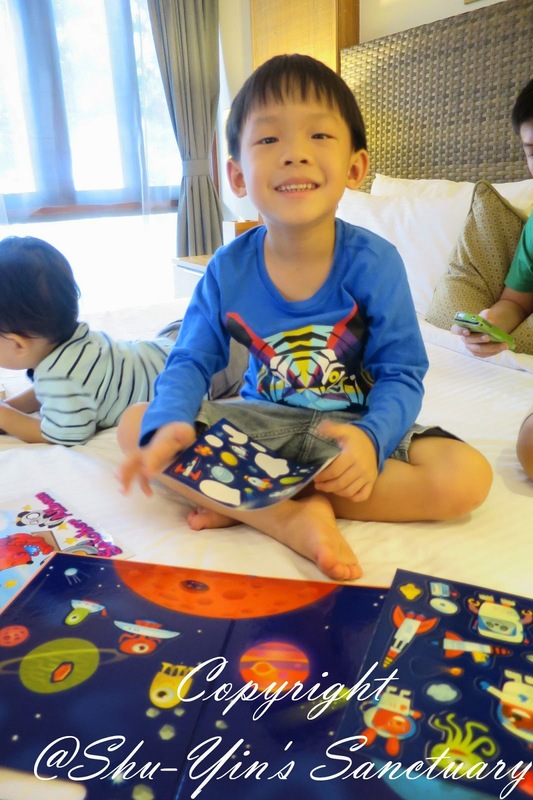 Shu-Yin's Sanctuary: Review: Mudpuppy Outer Space Play Scene - Another Great Travel Toy! 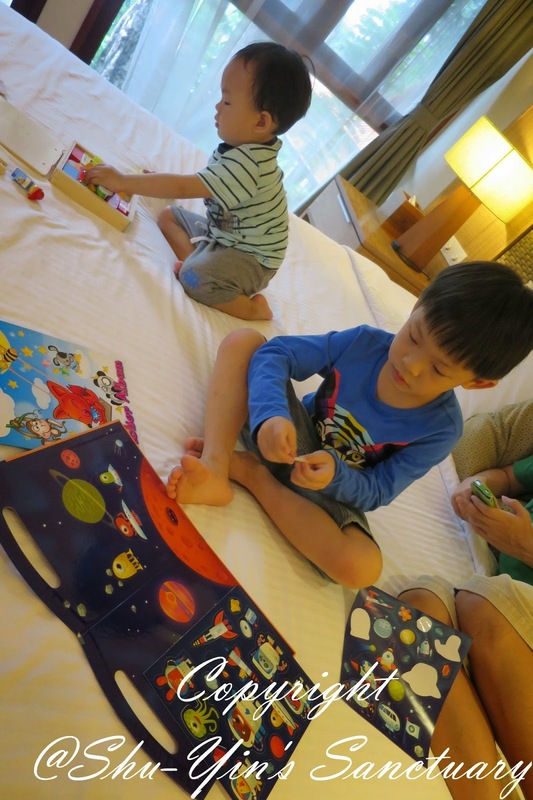 Review: Mudpuppy Outer Space Play Scene - Another Great Travel Toy! 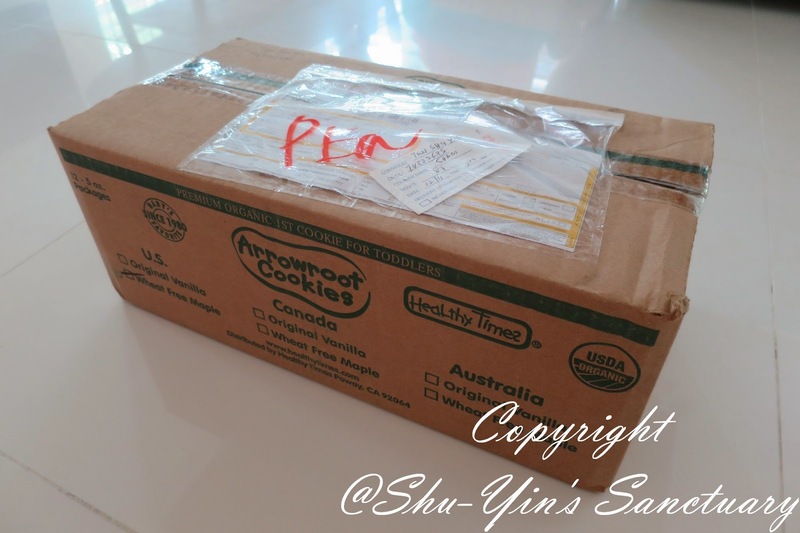 This is the another toy from Applecrumby & Fish which I received together with the Sevi Play Puzzle Transportation I reviewed earlier. Applecrumby & Fish was conceived in late 2011 and founded 9 mths later representing brands that are recognized for their premium quality. 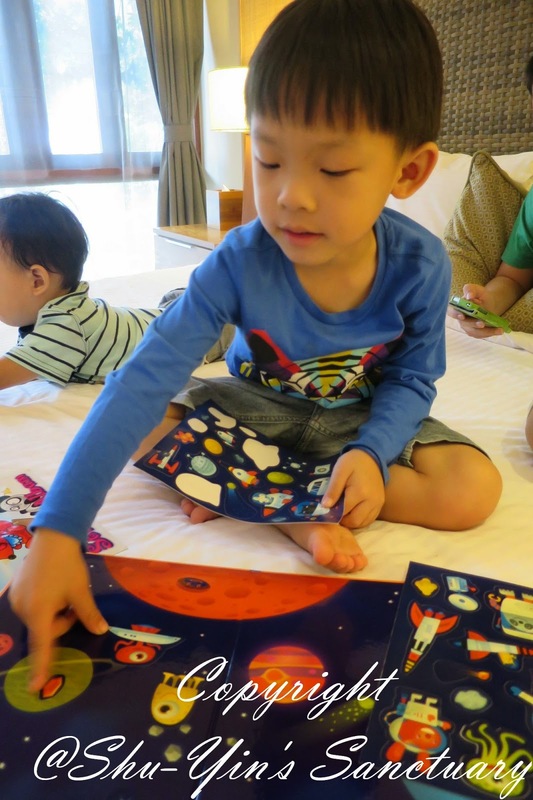 Applecrumby & Fish seeks to deliver a wide range of fine baby essentials to families Malaysia-wide, and internationally. 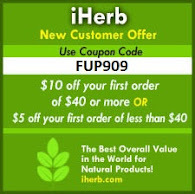 Their goal is simple; they do what they can in alleviating the customers shopping hassles. They constantly search the globe and carefully pick innovative and ingenuous products. Today, Applecrumby & Fish has grown at a tremendous pace and is proudly a market leader in the niche and premium baby industry. They strive to improve and grow in order to serve their customers better. 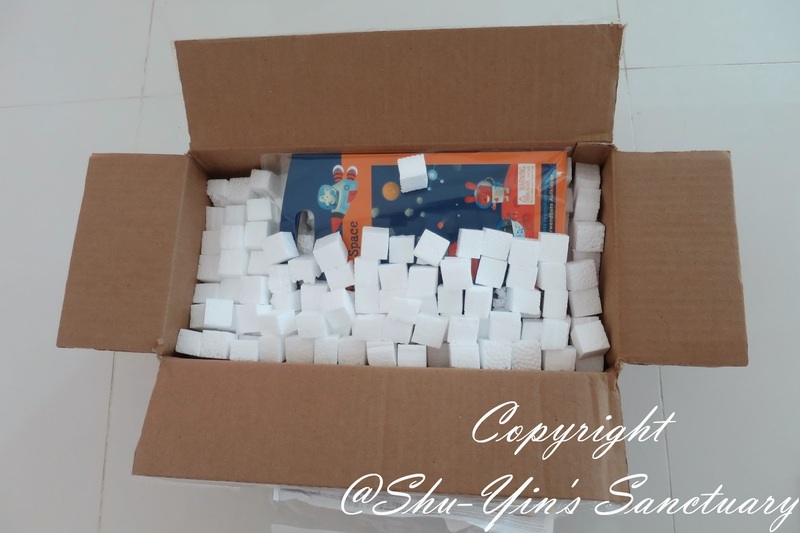 And just as I mentioned earlier, the packaging came in a sturdy brown box and when opened, it was filled up of square foams to cushion the products. Mudpuppy is the children’s toy and gift division of Galison was first introduced into the UK in 2008, when Stepping Stones Marketing commenced importing the brand to provide to retailers from our Cardiff distribution warehouse. Since that time the brand has significantly grown in the UK and is now a huge favourite with parents and children alike. The Mudpuppy product lines are all beautifully designed and have a great appeal to both childern and adults. Now let's talk about the Mudpuppy Outer Space Play Scene we received. 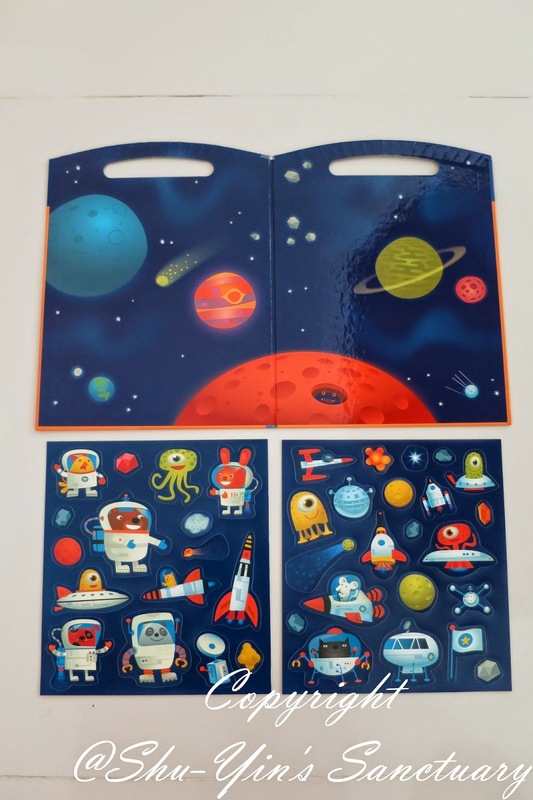 It comes packaged in a clear plastic pouch, protecting the surface of the smooth surface of this board book. Upon removing the clear plastic cover, you can see that the colours are bold and vibrant. 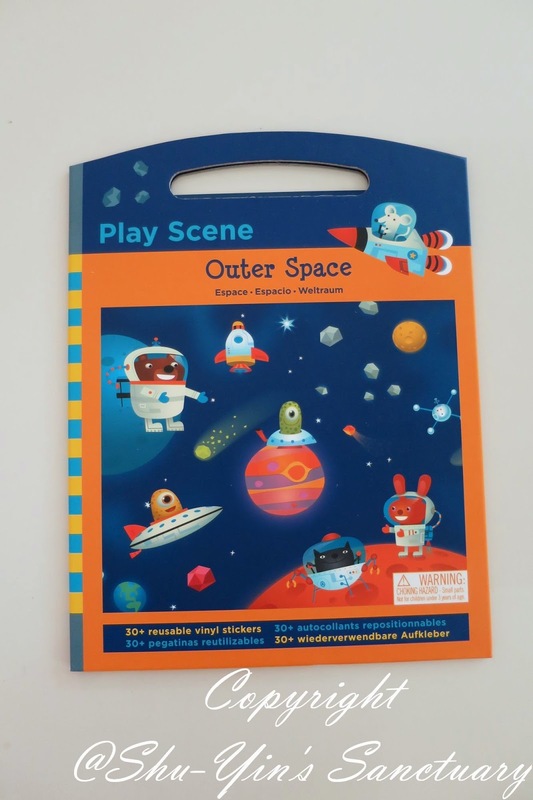 The front of the board book shows that this is an Outer Space Play Scene board with some examples of the stickers shown. 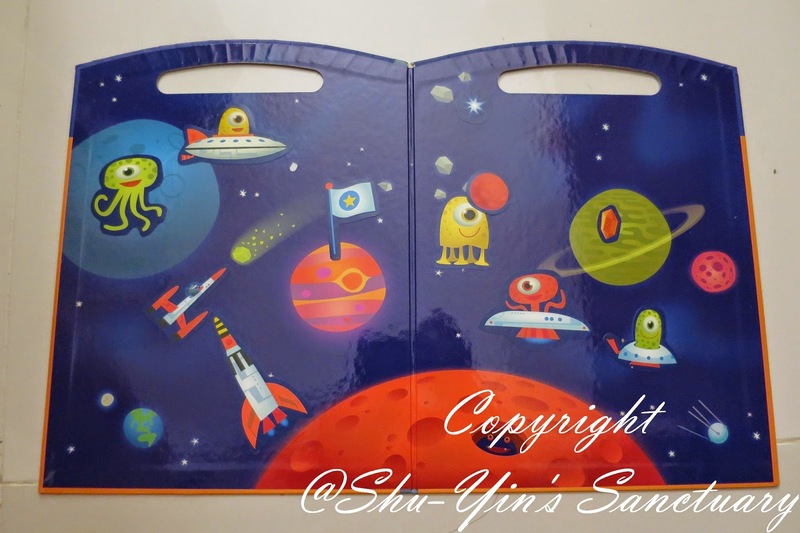 This board book measures 8 x 10-1/2" (20 x 27 cm) and also comes with a handle and is easy for the kids to hold. 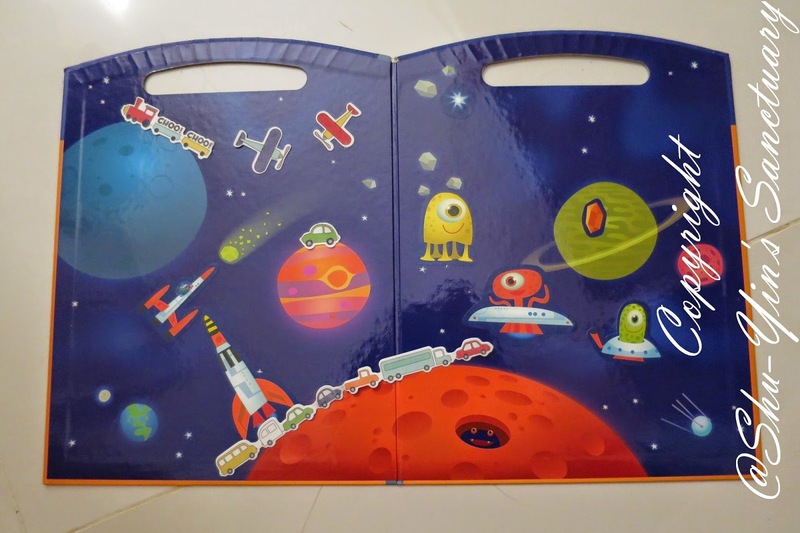 Open the board book and it revealed a double page Outer Space Scene Board. The Scene Board surface is smooth and glossy. And it comes with 2 sheets of reusable vinyl stickers, filled with earth animals and aliens, and even some asteroids. Shern had a great time arranging the vinyl stickers to his liking. 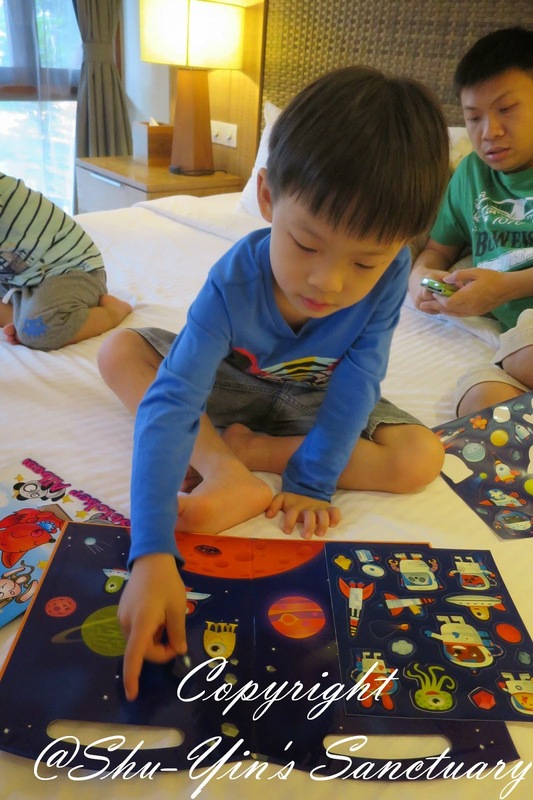 He placed the stickers to make his own scene and story, and spent quite an hour very occupied with it. 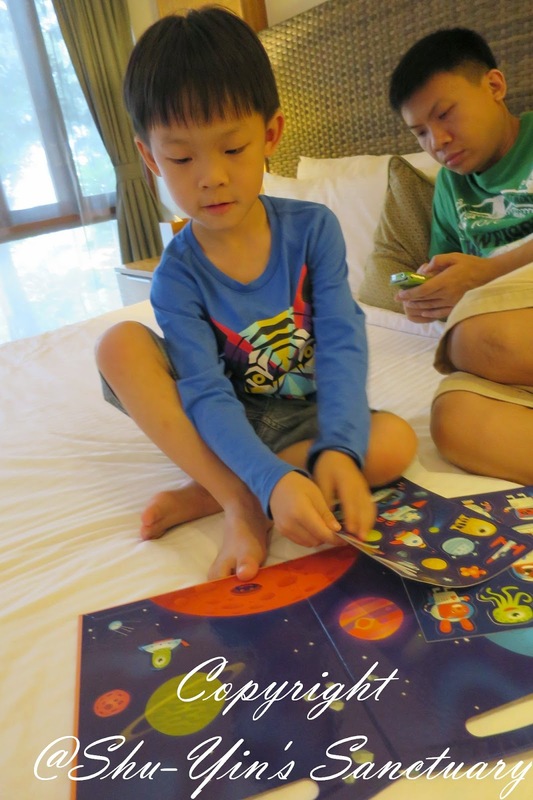 He had fun letting the Earth Animals and Aliens co-exists on the Outer Space and dodging asteroids! Lots of space for imaginative play! Some of the vinyl stickers he placed them on the Scene Board. He learned quite many things from this. 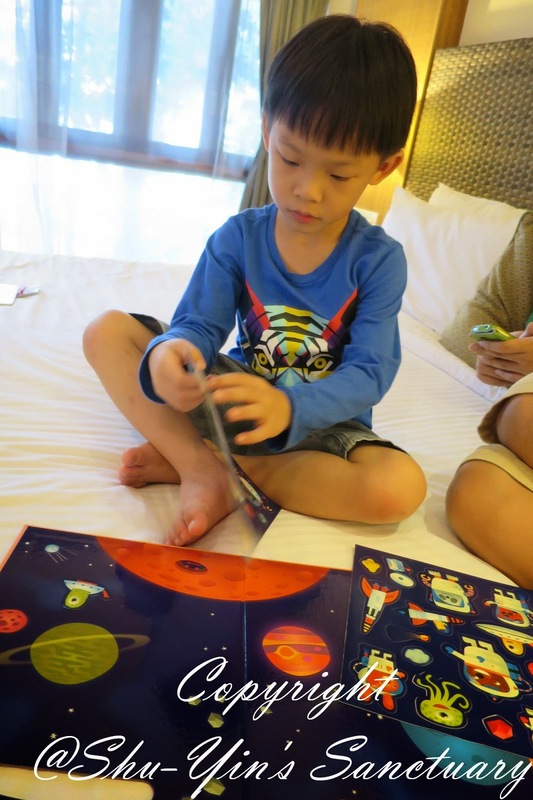 He learnt what is an asteroid and that there are different planets in our galaxy and Earth is one of the planets. This Scene Board broadens his knowledge on Outer Space. One thing I didn't quite like is that the vinyl sticker pieces provided are quite thin, and therefore easily folded or crushed. And is totally meant for older kids like Shern. Shern sometimes even had some difficulty removing them carefully from the sticker sheet. I would prefer a much thicker vinyl sticker pieces. And this Scene Board is only for vinyl stickers, which means that you can't use it for the usual normal stickers. Shern tried to stick his normal stickers on the board (the trains, cars and plane stickers), they stick on the board, but they cannot be removed or re-stick again without spoiling them. Overall, this Mudpuppy Outer Space Play Scene makes a good travel toy, with minimal mess and lotsa space for imaginative play! 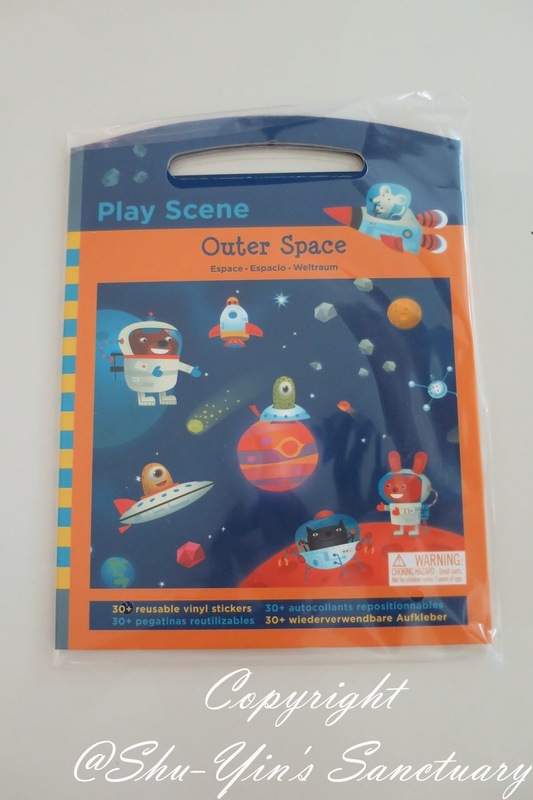 You can purchase Mudpuppy Outer Space Play Scene from Applecrumby & Fish Website. Please click to view more toys from Mudpuppy brand. To purchase other quality and branded toys and goods, please visit Applecrumby & Fish Website. * Disclosure: I received a Mudpuppy Outer Space Play Scene review purpose, but no monetary incentive was received. All text and opinions are of my own and represents my honest opinion of the product(s).